This week, KinematicSoup is announcing official integration with Editor VR as part of the platform’s latest update. That means any of the 6,000 plus people that have already downloaded the software in its alpha state can access this new tool, which lets multiple people collaborate in real-time in multiple ways. Think of it like multiplayer VR as you’re actually making your game; using position tracked controls users can intuitively build a scene together. This has a ton of potential for optimising VR development, and you can see why in the trailer above, released in January. Not only can two people enter VR together to edit scenes with each other, but one person could go into VR while the other works on the game from the traditional screen. The studio describes this as the out of VR developer doing ‘Big Picture work’ while the in-VR developer does ‘detail work’ and provides feedback. KinematicSoup says the app could make VR development much more efficient and speedier. 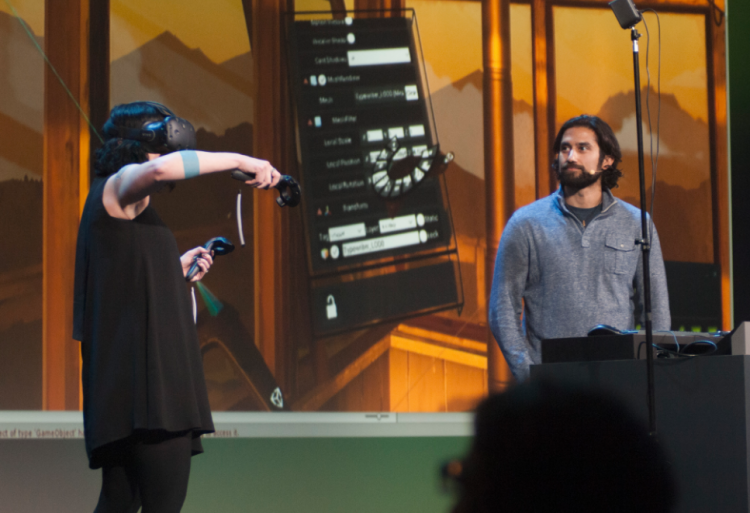 What really captures out attention, though, is the possibilities Scene Fusion could have when combined with other Editor VR Tools like Tvori, allowing people to collaborate not just with object placement but other creative aspects. Scene Fusion is available as a premium non-VR plug-in for Unity too, but Editor VR hasn’t really been established as a monetizable platform yet, so it’s unclear when or how Tools developers will make money. In fact there’s still a lot to learn about Editor VR as a whole, but Tools such as these suggest Unity is well on its way to making the accessible development platform it envisions for the future, whether people are making VR or non-VR content.